LaserBlack Enhancer: Although the size of only A3 / A4, it is difficult to meet the use of the industry, the dot gain rate may also be less than 10%, but for those small plate makers is a very affordable method, the reason is cheap equipment, table-top machine can be used in the office either from a A3 laser printer or a small four-in-one A4 machine with also good results, use of tracing paper the cost is very low, if to be printed with many colors can use the film for good registration with a laser printer to print, and then go through the LaserBlack machine to dissolve the black toner powder into a thin black layer covering the black image area to make a higher black density over3.50, which is good enough for a variety of printing plate making. (LaserBlack Enhancer currently marketing 20000 units worldwide). Small, economy and convenient, and with the application of Photoshop… and other software color separation with screening dot also can be made. Many users of the industry love it, especially for stamp / nameplate / stickers / T-shirts and all other printing industries. 1. How is LaserBlack used? Images on monitor, printed on translucent paper or transparent film by laser printer, then go through our LaserBlack Enhancer can get dark enough density as traditional photo film for exposing plate directly to make all kinds of printing plate. 2. How is the result of it? No matter what you print, we can make it 300 to 400% darker. The density can be high up to 3.0 to 4.0 (Depends on your printer). 3. Does it effects the blank areas? LaserBlack is a clear solution, leaving no visible residue effecting the density in transparent areas. 4. Will it fix the toner image forever? 5. Will it work on inkjet prints? No, LaserBlack is designed for laserjet printers only. 6. How about consumption of LaserBlack solution? A4 2000 sheets per liter, A3 1000 sheets per liter. 7. How about finest character and dot? It depends on your printer, no matter what you print, as long as you are satisfied with the print, we just make it 300 to 400% darker density for you to make a good plate. New generation printers such as 1200 x 1200 dpi can get fine print so as to get better enhanced results absolutely. 8. Is it really non-toxic and no harm to human? Yes, we use hi-tech non-toxic solution, not harmful to human. 9. Can I use inside the room? Yes, you can use it inside the room, only suggest to open the door for venting. No, as we do not use strong and toxic solvent, there is no problem of shipment. 11. What is a proper material for printer? As long as it is a translucent paper or transparent film can be printed with your laser printer which is good enough for our enhancer. However, if your requirement is critical, we will suggest you to use our paper or film to get best enhanced results for good registration for color printing. 12. After procession, is it really use water to clean off ? After operation just wash off your hands with tap water. 13. Can I use any brand of laser printer? Yes, but will suggest to use HP or Canon for best enhancing results. 14. Is the density anything to do with drying method? Yes, each set of LB enhancer attached with a Quick-Black Gun, suggest to use this Q-B gun to get quick and best results. 15. Can I use recycle toner cartridge? Of course you can use recycle toner cartridge, sometimes, the enhanced result is better than the original one. 16. What kind of printing plate making can be used? All kinds of plate making need a positive or negative film to expose the image can use LaserBlack R System. Now the density can reach 3.0, so it is no problem even to expose the longest exposure needed as for 7mm photopolymer plate directly for corrugated board printing. 17. Shall I adjust the enhancer frequently? No, once the enhancer has been set up, you will not need to adjust it any more. Unless you want to adjust it for applying more or less solution. One year warranty and after service for long. 19. Any tips to reach more black density? It shows that if you lay down the paper 2-4 minutes after enhancing, then dry it with Q-B gun. The density can increase from 1.05 to 3.24 – 3.49, which means 309% to 332% black density increased. To put the enhanced paper aside for 2-4 minutes then drying it, you can get best enhanced results. 20. In addition to this, any other way to increase density? To release the pressure between 2 rollers in order to carry more solution applying to paper surface, lay it down for 2-4 minutes then dry up will increase density definitely. 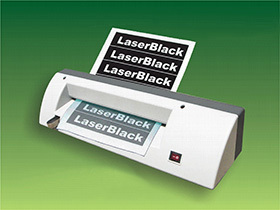 LaserBlack enhancer is a most economic and quick way to make a negative film on tracing paper or transparent film from your own HP laser printer the biggest size now is A3. In case of any query, please do not hesitate to contact us, we will be very happy to answer you all the questions. 21. If the black result is not so good what should we do? Check if drying step is not complete / running out of toner in the cartridge / 100% black setting on your original file / using LaserBlack super black toner cartridge? Most economic film maker In the market. kind of plate exposure, do not have to use image setter or photo film from a reproduction camera anymore. It is very simple and easy, everybody can do it. Even a most opaque density needed. The longest exposure time for a 7 mm thickness photopolymer plate can be exposing directly for corrugated board printing. Cost you only tracing paper, but get darkened film results, Ready for exposure to make all kind of plates including longest exposure time needed thickest 7mm photopolymer plates. ◎	It is as simple and easy as to operate a fax machine. ◎	Motors are UL/CE listed, all the parts are guaranteed. ◎	No air pollution not harmful to your health any more. ◎	LaserBlack is a non-toxic, friendly, green chemical. ◎	Just a laser print onto tracing paper from your P/C. ◎	Same good results with fine line / character and dots. ◎	Good for all kinds of exposing during plate making. The price is including air freight by EMS door to door service or equivalent air postage where EMS is not available. You will have your goods in 7 days. lb@laserblack.net with your full name, address and tel / fax numbers. For quick access once you have remitted the payment please give us a scan copy of the bank slip. We are very proud to announce that we have been approved & granted Certificate of Test No. R08022201E, Meantime CE Declaration of Conformity is also available for all the EU dealers and clients from us under your request.